Save with purchase of this set! 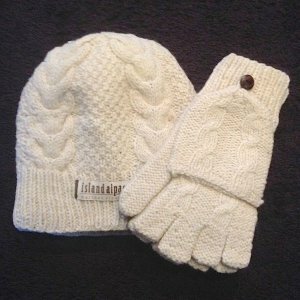 Dual Purpose Comfort and Warmth with this Hat and Fingerless Glove Set! These handmade, cable-hooded fingerless gloves and hats are crafted using 100% alpaca and are a true example of individual workmanship, and the beauty of alpaca warmth and comfort. Enjoy the option of wearing them as mittens with the flap folded over, or with the flap pulled back and finger tips exposed (secured with a top button) for full dexterity to complete detailed work where more tactile sensitivity is needed. Great use as a texting glove! Save with the Set! Pair these hooded fingerless gloves with our matching hand-knit alpaca hat that is lined for additional comfort and warmth! To order the hooded texting gloves only, click HERE. To order the cable hat only, click HERE. Sizing: One size fits most adults and teens. Handmade in La Paz Bolivia; our work-at-home moms in the Bolivian Andes are paid fair-trade wages to hand-knit these wonderfully soft, incredibly warm, lightweight alpaca hooded fingerless gloves and hats!